Mr Hunt said violence against reporters had reached "alarming levels globally". More recently, she represented Nadia Murad - a Nobel Peace Prize winner who was captured and tortured by so-called Islamic State. 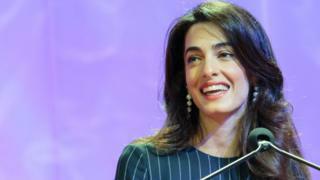 Mr Hunt said Ms Clooney's experience made her "ideally placed" to ensure the UK's efforts to protect global press freedom had "real impact for journalists". He added: "She will use her expertise to chair a panel comprising the world's best legal minds to develop and promote legal mechanisms to prevent and reverse media abuses."